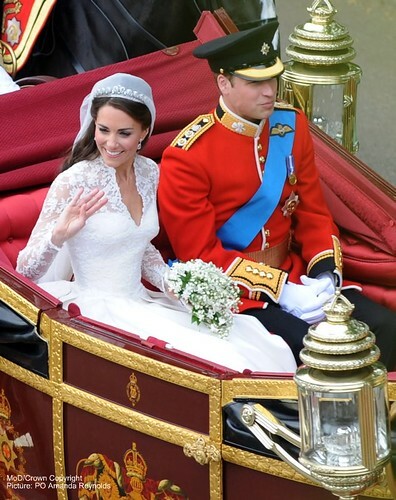 Following their wedding today The Duke and Duchess of Cambridge can be seen passing through Horseguards Parade making their way from Westminster Abbey on their way to Buckingham Palace. More than 1,300 personnel from across the Royal Navy, Army and Royal Air Force played a key role in the ceremonial elements of the Royal Wedding today. Their roles included Guard duties, lining the ceremonial route, musical support through ceremonial bands, and a spectacular seven-aircraft flypast from the RAF Battle of Britain Memorial Flight and two Tornado and two Typhoon fast jets. Representing all of the Armed Forces inside the Abbey for the service was Chief of the Defence Staff General Sir David Richards, Chief of the Naval Staff Admiral Sir Mark Stanhope, Chief of the General Staff General Sir Peter Wall, and Chief of the Air Staff Air Chief Marshal Sir Stephen Dalton. 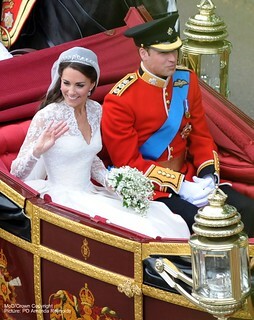 Further afield, troops in Afghanistan watched the service and held their own celebrations to wish the couple well. Alongside his current Royal Air Force Search and Rescue role, HRH Prince William is also Commodore-in-Chief of Submarines, Colonel of the Irish Guards, Royal Honorary Air Commandant of RAF Coningsby and Patron of the RAF Battle of Britain Memorial Flight.